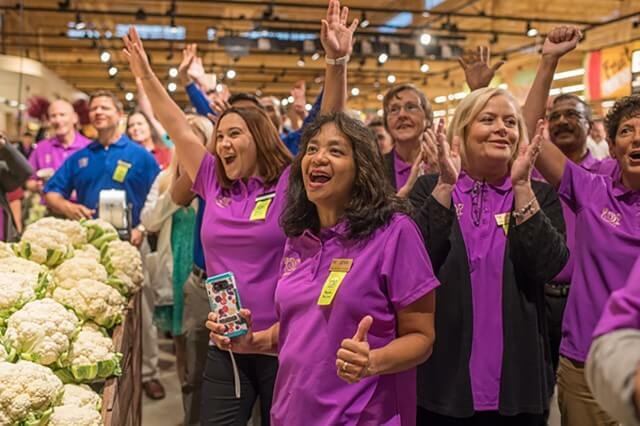 At Wegmans, our customers know they can turn to us for health and wellness support. With access to meal prep ideas, fun tips and tricks, and a variety of products to keep their minds and bodies in tip-top shape, wellness is our passion. But the dedication we have to promoting a healthy lifestyle for our customers extends to our team members. We believe that in order for our employees to take care of their customers, they should have the ability to take care of their health, too. We offer life benefits, generous health coverage options and wellness programs to ensure our employees are living better, more fulfilling lives. Our wellness program services include blood pressure wellness, free flu shots, tobacco cessation programs, and even a yearly onsite health screening that covers BP, cholesterol, weight, and BMI – for free! And for our employees interested in getting a head start on financial wellness-planning for retirement, we have 401(k) programs. Since the inception of our wellness program services, our data shows that employees have reduced their blood pressure and body mass index (BMI). We offer coaching and guidance from our pharmacists and dieticians, on-site yoga, Weight Watchers at Work meetings, fitness discounts and more. Moreover, our “get-moving” employee initiatives don’t just stop within the walls of Wegmans. We have made strides to inspire residents of nearby communities to be more active through our “Passport to Family Wellness” program. City recreation programs, fitness programs and park conservancy groups have teamed up with Wegmans to distribute a pocket-sized “passport” for families looking to explore local nature trails. Since then, hundreds of people have taken their “passports” with them and discovered new ways to improve their health. Our mission is to be a dependable resource to wellness. With our initiatives, we hope to inspire health and wellness all over the country, starting with the continued care of our employees. Are you are seeking a place where your health is the top priority? Explore opportunities at your local Wegmans today!